Black Summer is a Hard Rock band that began by shaking the walls of their hometown of Long Island, New York in 2011. Now, the band is bringing the New York City hard rock scene to its knees with its self-titled debut release … Black Summer is an album amp’d with adrenaline. This band is made up of vocalist Vincent Verzino, drummer Frankie Fizz, as well as guitarists Peter Anthony and Jonathan Istrico. Black Summer’s musical style mixes a montage of brain-blistering bass, fret-shredded finesse and melodic metal into a hard-hitting, hard rock frenzy. “We’re a band of brothers. Our chemistry and shared musical interests creates a creative flow that leads directly from the studio to our live performances,” explains the band. The rave reviews will likely continue as Black Summer releases to radio and digital music outlets. The power of their live performances carries over into the ten tracks on their debut. The album only increases the band’s buzz – as CT of Gotham Rocks says, “Black Summer packs a mighty punch yet still manages to keep you hooked from start to finish. These guys have lots of potential.” Kayla Riley of Sirius XM Radio writes of the Black Summer debut as, “Offering a blend of metal & melodic riffs, it’s the fix that any true rock needs.” Black Summer is no stranger to success, racking up over 10,000 likes on Facebook. They’ve already shared the stage with acts such as Evans Blue, Fuel, 12 Stones, Eye Empire and Burn Halo. 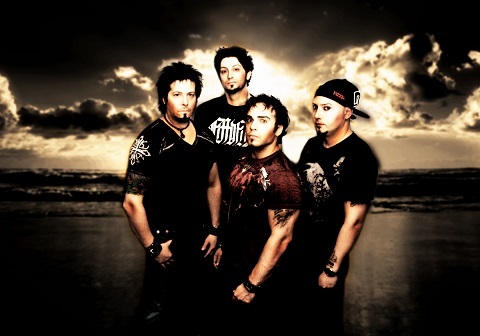 Black Summer’s style and sound have been explained as a mix of Sevendust and Drowning Pool; however there are hints of Breaking Benjamin and Papa Roach. Yet Black Summer’s sound still stands uniquely apart with their patented “in-your-face” modern rock. Key tracks on the album include the hard-hitting “Best of Me”, and high-lifting melodic hooks of “Into the Picture” and “Letting Go.” In addition, “Empty” and “The Grind” stand out as carefully crafted compositions. It’s easy to understand – from this debut album – that this quintet has everything it needs to move beyond not only Long Island, New York – but into the global hard rock limelight. Autumn blackouts are rare … unless they’re caused by a Black Summer power surge.